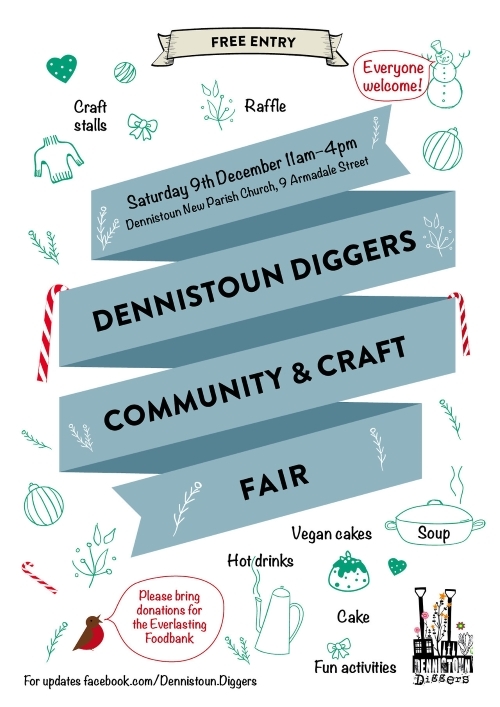 Join the Dennistoun Diggers for a chance to find out more about your local community garden and enjoy what the fair has to offer. You can enjoy a variety of stalls with locally hand crafted gifts and Christmas decorations, try some delicious goodies from the home baking cafe, take part in activities for all the family, and be in with a chance to win raffle prizes from local Dennistoun businesses and much much more. The Dennistoun Diggers garden had a makeover in 2016/17 and they have lots more growing space so come along and find out how you can get involved. Donations are being accepted on the day for the Everlasting Food Bank.